It is a gesture of divine spirit carried out by Muslims around the world, when performing the Qurbani on the occasion of Eid-ul-Azha. This blessed journey commemorates the noble act of Hazrat Ibrahim Alaihis-Salaam who was willing to sacrifice his son Hazrat Ismail Alaihis-Salam as per the direction of Allah Subhana Hoo Wa Tala. In this pretext, we understand that the job of Qurbani is done for seeking the blessing of Allah Subhana Hoo Wa Tala. This practice involves effort, as all good habits do. The blessed journey includes finding a desired animal, bringing it home, nourishing it, and safekeeping the blessed animal until scarification. This is then followed by distribution of meat to relatives/friends and those in greater need (May Allah Subhana Hoo Wa Tala continue to provide for them and we thank HIM (Allah Subhana Hoo Wa Tala) for all HE has provided us). During this process, getting the services of a qualified Butcher maybe a difficult task, particularly in Muslim dominant countries due to their heavy demand. All the while, a Muslim gets the feeling of great satisfaction during and after the completion of this Divine task. 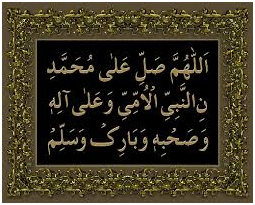 With all that reflected upon, I have come to appreciate that Allah Subhana Hoo Wa Tala helps us with continued ease if we recite “Durood Sharif” during the process. On this Eid-e-Qurban, I performed Qurbani, Alhamdo Lillah. My dear Muslim brother, asked if I could perform Qurbani of 5 lambs on his behalf, as he is residing in a foreign county and felt the blessing of the process was important to his spiritual realization. It was a great privilege and honour for me to accept his humbled request as it provided me an opportunity of honour in the court of Allah Subhana Hoo Wa Tala. I accepted this task happily and my brother asked me to immerse myself in “Durood Sharif” during the process of this blessed Baraka. Under his suggestion, I commenced with “Durood Sharif” and went to find the chosen lambs. I performed ablution and started reciting “Durood Sharif” as well. Usually, I buy the lambs one day before Eid-ul-Azha but this time I decided to buy the animals three days before Eid. I visited various animal markets and through the Barkah of “Durood Sharif”, Allah Subhana Hoo Wa Tala guided me to get very healthy and beautiful lambs. It is noteworthy to mention that the seller of the animals performed Namaz-e-Asr along with me in a Masjid at the time. He provided me with two workers to accompany me to bring the lambs home comfortably. Next, the transport driver was very cooperative and facilitated a great and comfortable transport of the lambs, an experience that was refreshing, and undoubtedly due to constant immersion of “Durood Sharif”. I looked after the animals with great care and provided them with regular food and clean water all the while reciting “Durood Sharif”. What happened next was shocking! The day before Eid, there was an acute shortage of lambs for Qurbani! I was immediately Thankful to our Rabb (Allah Subhana Hoo Wa Tala) and felt comfort weave through my heart. I reflected at the moment on the special blessing from reciting “Durood Sharif” and felt that this was a sign from Allah Subhana Hoo Wa Tala. After all, every year I had bought the animals on the last day, this year miraculously, or not, depending on how you see it, I was motivated or inspired (depending on how you see it) to purchase the lambs early. I had booked a Butcher to sacrifice the animals on first day of Eid early in the morning. I was surprised to find however, that on the blessed day of Eid he was nowhere to be found and was unreachable even by my persistent phone calls as his phone was off. At this moment of panic, I thought about my options and only one came to mind, you know what it was? Having full trust in Allah Subhana Hoo Wa Tala and keep on reciting “Durood Sharif”. As I headed to the tent arranged for Qurbani at my apartments complex, I found a number of Butchers therein helping to sacrifice the lambs, working together in harmony at the same time. With thanks to our Rabb (Allah Subhana Hoo Wa Tala), I quickly approached them, this must be a sign from HIM (Allah Subhana Hoo Wa Tala) after all. I talked to a butcher and he graciously butchered the lambs with his team members. It was another wonder that at the same time, I got a comfortable and airy space at the covered platform adjacent to the tent for meat cutting. I was left with one conclusion, Allah Subhana Hoo Wa Tala made this special arrangement through Baraka of “Durood Sharif”. The butcher and his team members performed the job in a highly professional manner, the lambs were treated with respect and humility. He prepared the pieces of meat skillfully and the people roaming around were admiring his professional services, in fact many of them were now desiring his services for the Qurbani of their animals. What an incredible manifestation that is the Baraka of “Durood Sharif”. Subsequently, I mixed the meat and then distributed amongst the relatives, friends and poor. During the entire distribution, I recited “Durood Sharif”. I am so grateful and reverent that the task was accomplished in a highly satisfactory manner – Shukr Alhamdo Lillah. I have gone through this blessed and pleasant experience with a great lifelong companion. It is my prayer and wish for anyone reading these words that they find this companion also. I believe and have experienced that with this companion Allah Subhana Hoo Wa Tala helps us through all difficult situations.